We where very fortunate to recently be invited into our clients newly completed home to see how everything had come together. This stunning home is designed by the very talented team at Auhaus Architecture and is amazing in every way! From the grand yet secluded enterance to the courtyard pool and the green lightwell, everything is designed with great thought and style. All of the finishes are on trend, ultra high end with a great attention to detail. It was so lovely to see our timber joinery pieces in this beautiful space! Our client designed the interior of their home with a palette of polished concrete, white, black, brass and of course timber. These materials work so well together and as these elements where repeated throughout the entire home, there was a beautiful sense of flow. 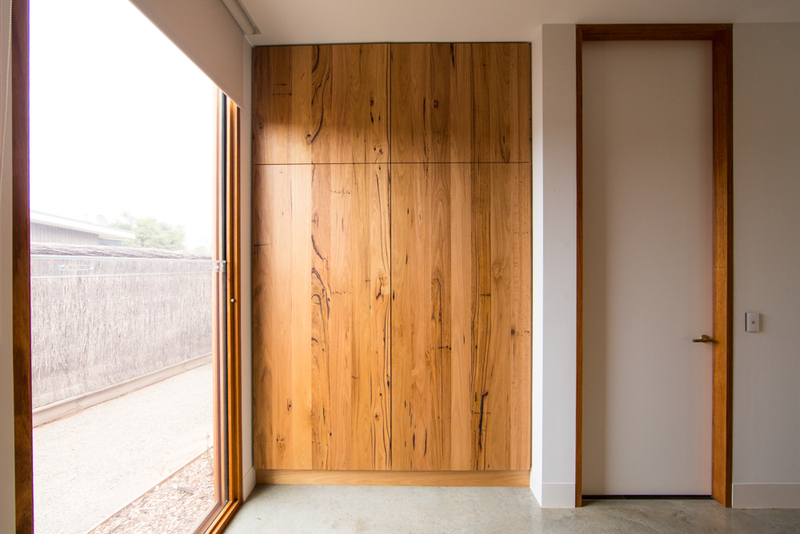 The client chose to use a medium feature recycled Messmate for their timber joinery pieces. This ensured that the black sapline features tied in with the black elements in the rooms whilst not over powering the design. A large space calls for a large piece of furniture to create balance. This beautiful open plan living room and kitchen has lots of space to fill! We created a bespoke timber floating TV unit to the clients design with spaces to both store items and display treasures. The push to open cupboards create a modern streamlined look with plenty of space to hide away items. To continue the wood theme into the master suite, all of the joinery was created from solid timber. This includes the epic walk in robe, wardrobes and a lowboy. In so many bedroom designs, the cabinetry is hidden away from sight as it adds nothing to the design. In this space however, the robe is the hero! The client also wanted some design features to showcase treasured items and plants. A solid timber desk makes sitting down to get some work done, clean up some life admin or get stuck into the homework that little bit more enjoyable! I am lucky to have a beautful timber desk to work on in the office and I quite often find myself mindlessly stairing at an interesting piece of character in the timber or running my hand over the smooth finish. It is these small joys that make a big difference in life! This beautiful home has a total of 5 bathrooms with 5 stunning timber vanities! The warm tone of the recycled Messmate timber creates a beautiful sense of balance with the concrete, dark grey tiles, white walls and glass in the bathroom decor. 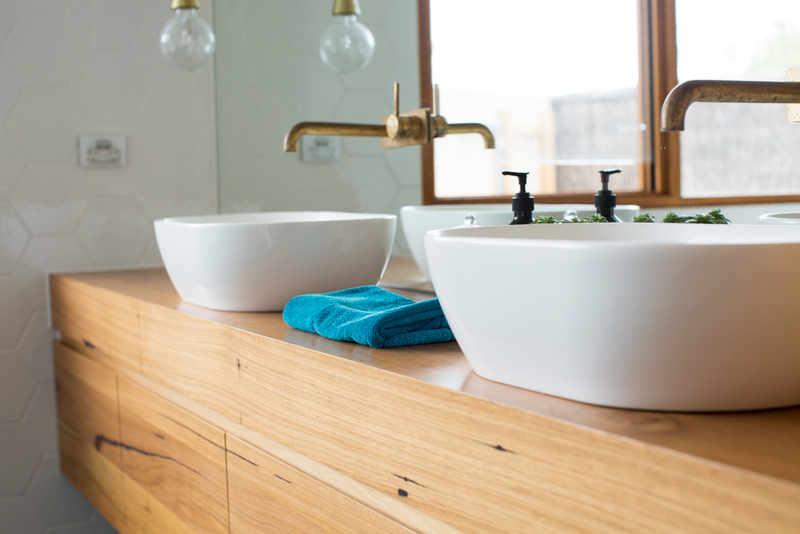 Each floating vanity was designed and made to order so that it was perfect for the design and space of each bathroom. The perfect finishing touch to this home is a large 10 seater dining table created from recycled Messmate timber. The angled box legs on the Jan Juc table design creates an ultra modern look with that ultimate sense of timelessness that will ensure it will always be in style. The Messmate timber of this dining table is a beautiful mid tone brown with black features such as sap lines and pockets. Want to discuss your ideas for timber joinery in your home? Contact us via the link below!